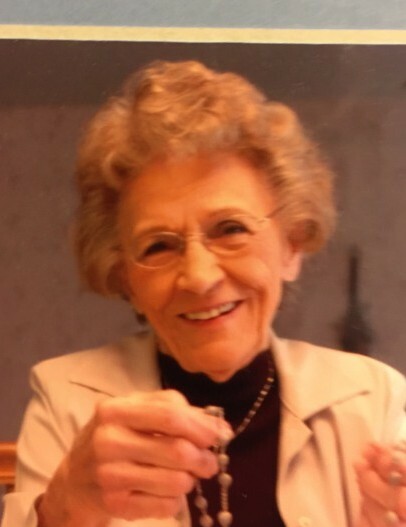 Rose Neuburger, 95, formerly, of Hays, died Saturday, September 1, 2018 at Regency Care Center at Monroe in Monroe, Washington. She was born August 30, 1923 in Ogallah to Ambrose and Eugenia (Baumgartner) Weber. She married Norbert Neuburger on July 7, 1943, in Jacksonville, Florida. They were owners of Neuburger’s Bakery. While living in Hays she was very active in the Adoration Chapel. Survivors include two sons; Gary and wife Judy, Cibolo, TX, Pat and wife Kathy, Las Vegas, NV and a daughter; Cindy Lang and husband David, Monroe, WA, 9 grandchildren; 24 great-grandchildren and 1 great-grandchild. She was preceded in death by her husband; 2 sisters, Mary and Regina; one brother, Robert and two great-grandchildren. Funeral services will be held at 10:00 A.M. on Saturday, September 8, 2018 at St. Joseph Catholic Church, 201 W. 13th St., Hays, KS 67601. Burial will follow at the St. Joseph Cemetery, Hays. Visitation will be held on Friday, September 7, 2018 from 5-7:00 P.M. and Saturday, from 9-9:30 A.M., both being held at Brock’s-Keithley Funeral Chapel & Crematory, 2509 Vine St., Hays. A Perpetual Eucharistic Adoration Adorers Rosary will be recited at 5:00 P.M. with a parish vigil service at 5:30 P.M., both at the funeral home on Friday. Memorials are suggested to Holy Family Elementary School and can mailed or left with the funeral home. Condolences may be sent by guest book at www.keithleyfuneralchapels.com or by email at keithleyfuneralhomes@gmail.com.